Earlier today, the anonymous genius behind Bad Lip Reading posted his remix of The Force Awakens, starring Mark Hamill as the voice of Han Solo. 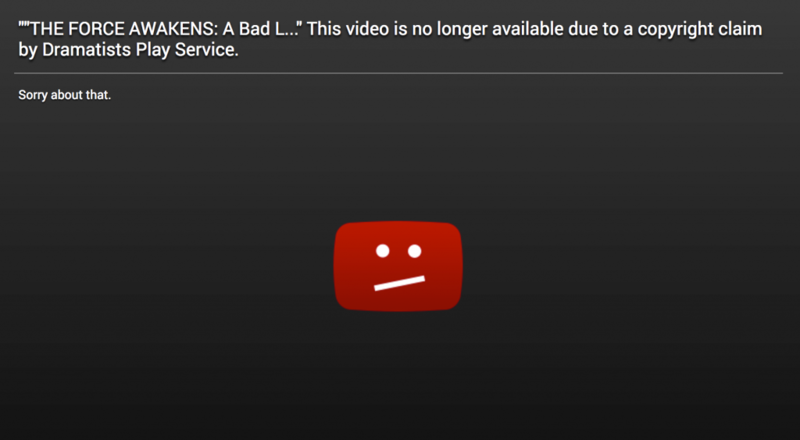 Unfortunately, the video was taken down by a copyright claim from an unlikely source. Not from Lucasfilm or Disney, but the Dramatists Play Service, a NYC-based publishing and licensing house for theatrical stage plays. You may be asking yourself, what does the Dramatists Play Service have to do with Star Wars? As far as I can tell, absolutely nothing. They don’t appear to have any clear affiliation with the franchise at all. But anyone can make a copyright claim against any video, with little consequence. YouTube “doesn’t mediate copyright disputes,” and while the DMCA allows for penalties for false claims, they rarely result in legal action. I called the Dramatists Play Service at their headquarters in New York City to get a statement, but they’re closed for the day. I’ll reach out when they open tomorrow to see what I can find out. Update: Dramatists Play Service made a public statement that the claim was a mistake, and they’re working to get it reinstated. We have no claim on any works in the video and will be working with YouTube to get the video reinstated ASAP. Update: I spoke by phone to David Moore, vice president at Dramatists Play Service. He said that they’re a small company with 30 employees, constantly monitoring the internet for potential copyright issues for their 4,000 licensed titles on behalf of their playwrights. Moore said Dramatists Play Service only files DMCA takedowns with YouTube manually, rather than any automated process or with Content ID. He repeatedly emphasized that this was human error, with no malicious intent. I asked him about the source of the error, for example, if it matched a similar play title that they represent, but he repeated that it was human error.